The office of New York Attorney General Eliot Spitzer has reached an agreement with Fast Forward, LLC, a wholesaler of consumer products, to recall thousands of childrens lunch boxes containing lead. In addition, two of the nations largest retailers, Wal-Mart and Target, have voluntarily pulled those lunch boxes from their shelves. However, as of November 30, the lunch boxes were still for sale on eBay and may be found in smaller stores around the country. Fast Forward, which imported the lunch boxes from China, has also agreed to establish procedures to prevent it from selling or distributing products that violate hazardous materials laws and to ensure that the recalled lunch boxes are disposed of in accordance with New Yorks environmental rules. "The recall of these childrens products will protect children and our environment from the damaging effects of lead," Spitzer said. "I commend the distributor and Wal-Mart and Target for acting promptly to address this important matter." Between March and September 2005, thousands of soft plastic and mesh lunch boxes distributed by Fast Forward were sold by retailers across New York. Lead was used as an ingredient in the lunch boxes to help keep the vinyl stable. Retailers that sold the lunch boxes at issue in the Fast Forward recall include: Wal-Mart, Target, Cookies, JC Penney, Sears, Toys R Us, Value City, Rainbow, Marmaxx and RB Distributor. The Fast Forward companys label appears on the inside of the recalled lunch boxes. Spitzers investigation revealed that some of these vinyl lunch boxes contain levels of lead that exceed environmental protection laws. Laboratory tests determined that certain lunch boxes, specifically those with the comic book heroes Spiderman and Superman, had lead levels that exceeded a state law that limits the levels of lead and other heavy metals in packaging products or other packages. Lead is a toxic metal that can cause neurological and developmental damage in children. When Spitzers office brought the matter to the attention of two of the nations largest retailers, Wal-Mart and Target, both immediately agreed to pull the remaining lunch boxes from their shelves. In settling the investigation, Fast Forward agreed to recall from consumers and retail store shelves various vinyl lunch boxes featuring Spiderman, Superman, Batman, the Fantastic Four, and Precious Moments, as well as lunch boxes featuring Rocawear products. New York consumers who return lunch boxes to the retailer where each lunch box was purchased by February 28, 2006 will receive a cash refund with a receipt, or a store credit if they have no receipt. Consumers may also obtain a full refund by returning lunch boxes directly to Fast Forward by February 28, 2006 with a Refund Request Form available from the New York Attorney Generals Office. Fast Forward agreed to pay $7,000 in civil penalties and costs. Sanus Systems is recalling about 14,000 VisionMount model VMSA swing-arm television wall-mounting units. An undersized shaft within the wall mounting unit can cause the products main support component to loosen. As a result, the unit and the television it is supporting can fall from the wall. Sanus Systems has received one report of significant loosening in the products main support component. No incidents or injuries relating to unit failure have been reported. This is a swing arm wall mount for flat panel televisions. The TV wall mount being recalled is the VisionMount model VMSA. The TV wall mount measures 18.5 inches high and 29 inches wide and is sold in black and silver. There is no writing on the unit. The mounts were sold by audio-video stores from December 2004 through May 4, 2005 for about $350. Consumers should contact Sanus Systems immediately to request a free safety bracket and instructions on how to install the safety device. Consumer Contact: Contact Sanus Systems at (800) 359-5520 between 9:30 a.m. and 6 p.m. ET Monday through Friday, or go to the firms Web site at www.sanus.com. Louisville Ladders is recalling about 3,000 Multi-Purpose, Step-to-Straight, Combination, Manhole and Extension Trestle Ladders. The rung on the ladders could break near the side rail causing the user to fall. Louisville Ladder has received two reports of rungs breaking. No injuries have been reported. 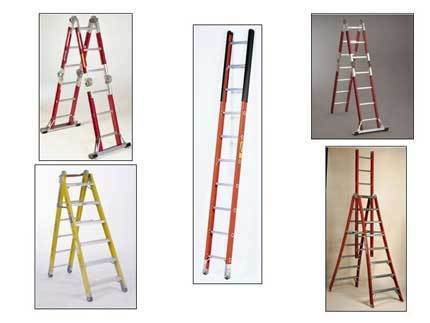 The recalled ladders are Type 1A industrial ladders with fiberglass rails and round aluminum rungs, and include the 14 model numbers listed on the chart with manufacture dates and date codes from November 2004 through March 2005. The model number and the manufacture date code for all models except the FA1012 and FA1016 model ladder are located on the model number/notice label on the side rail of the ladders. The date code for the model FA1012 and FA1016 ladder is located on the metal wrap-around adjacent to the hinges. The ladders were sold at industrial supply stores and home centers nationwide from November 2004 through June 2005 for between $75 and $235. Consumers should stop using the ladder immediately and contact Louisville Ladder for instructions on receiving a free inspection and replacement ladder if necessary. Consumer Contact: For additional information, contact Louisville Ladder at (800) 660-4356 between 8 a.m. and 5 p.m. ET Monday through Friday or visit the firms Web site at www.louisvilleladder.com. Delta Enterprise Corp. is recalling about 335 Lovs Europa Natural Color Cribs sold at Toys R Us. The cribs' paint contains high levels of lead. Lead poisoning in children is associated with behavioral problems, learning disabilities, hearing problems and growth retardation. The cribs are made of wood and are natural color. Only cribs that are labeled Lovs Europa with Style # 4827-2 M.F.G. No. : W 24088 Date: 22 JUN 2004 are included in the recall. The brand, style and date code are printed on a label attached to the mattress support platform. The cribs were sold exclusively at Toys R Us nationwide from July 2004 through August 2005 for about $200. Consumers should stop using the recalled crib immediately and return to retailer where purchased for a credit or refund. For additional information, contact Delta Enterprise Corp. toll-free at (877) 660-3777 between 9 a.m. and 5 p.m. ET Monday through Friday, or visit the firms Web site at www.deltaenterprise.com. November 17, 2005 Ford Motor Co. is recalling nearly 224,000 vehicles because their windshield wipers may malfunction. The National Highway Traffic Safety Administration (NHTSA) reports the windshield wiper motor on the vehicles may have been produced without grease being applied to the output shaft gear. No accidents or injuries had been reported in connection with the problem. Vehicles affected by the recall are all from the 2006 model year and the Escape, Expedition, Explorer, F-150, Ranger, Taurus, Mark LT, Navigator, Mariner and Mountaineer. The Pottery Barn Outlet is recalling about 900 "Spooky Tree" Tea-Light Holders. The recalled candleholders could allow tea lights to have a high flame. This poses a fire hazard and risk of burn injuries to consumers. This product was previously recalled by Pottery Barn on October 16, 2002. Pottery Barn Outlet has received one report of a flare-up. There are no reported injuries. During the previous recall, there were 10 reports of candleholders flaring and one consumer reported receiving a minor burn from the candle wax. The recalled candleholders are constructed of black wire and stand about 18 inches high. The tree branches hold six tea light candles in orange glass pots. The items were sold at 13 Pottery Barn Outlet and Williams-Sonoma Marketplace Outlet stores nationwide from September 2005 through October 2005 for about $23. Consumers should stop using the candleholders immediately and return them to the Pottery Barn Outlet store for a refund or exchange. Consumer Contact: For additional information, contact Pottery Barn Outlet at (800) 586-5615 between 7 a.m. and 5 p.m. PT Monday through Saturday. Target is recalling about 17,000 pillar candles with jewels. The paint coating on the outside of the candle can ignite, posing a fire hazard. The candles measure about 3-inches in diameter and come in two sizes 3-inches and 6-inches high. Each candle has a black paint coating and has eight diamond-like ornaments at evenly spaced points approximately 1-inch from the candles bottom edge. They are packaged in clear plastic wrapping which is tied at the top with a ribbon. Distributed by Target Corporation and the number 054 09 1533 or 054 09 2528 are printed on a label on the bottom of each candle. The candles were sold at Target stores nationwide during the month of August 2005 for about $5 or $8 depending on the size. Consumers should stop using the candles immediately and return them to the nearest Target store for a Target GiftCard worth the value of the returned candle. Consumer Contact: For additional information, contact Target at (800) 440-0680 between 7 a.m. and 6 p.m. CT, Monday through Friday, or visit Targets Web site at www.target.com.